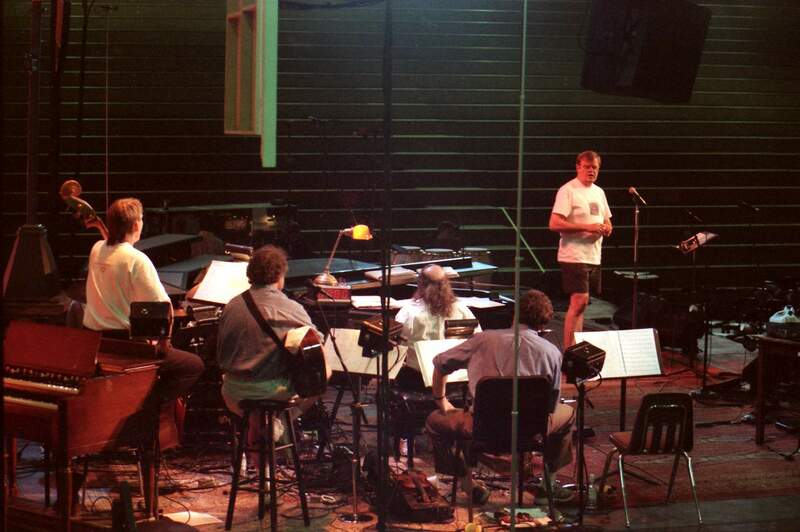 Garrison Keillor, host of “A Prairie Home Companion, rehearses in Durango on June 13, 1998, in the Field House at Fort Lewis College, before his show. This story was originally published in Cross Currents, a former magazine owned by The Durango Herald. It appeared June 5, 1998.It’s Saturday afternoon, April 18, and “A Prairie Home Companion’s” Garrison Keillor is joined on stage by comedians Paula Poundstone, Walter Bobbie and Roy Blount Jr.
“Did you hear about the hurricane that hit New Jersey?” one of them asks. Half the audience laughs; the other half groans and hisses. “Know why rail workers are so depressed?” someone else asks. More laughs, groans and even more hisses. Soon after, Keillor greets the audience. He’s sorry, he says, about the New Jersey jokes. He probably should be. This is “A Prairie Home Companion’s” annual joke show – live from New York City. Before long, New Jerseyans who crossed the border aren’t feeling as persecuted. Keillor and his guests ramble on with a host of lawyer jokes, shooting them off at lightning speed. It gets quiet. Keillor is again apologizing to his targets. He speaks in his usual soft, laconic voice. It’s soothing. He sounds quite sincere. Hardly a group, profession or state is spared being the brunt of jokes during this broadcast. Idaho gets it because of its politics, Utah because of the Mormons and Minnesota because of the Lutherans. The annual joke show strays slightly from “A Prairie Home Companion’s” usual agenda. It’s one joke after another until the audience’s guts ache from laughter. Keillor himself chuckles. But he never belts out a laugh so loud that he overpowers the audience. Keillor is there to make people laugh. It’s what he’s been doing since “A Prairie Home Companion” went on the airwaves in 1974. The weekly variety show features comedy sketches, music, authors and other special guests. It also features Keillor’s signature monologue, “The News From Lake Wobegon.” It is produced by Minnesota Public Radio. Most of Keillor’s live shows originate from The Fitzgerald Theater in St. Paul, Minn. But June 13, Keillor and his crew will set up shop in Durango. The only other “A Prairie Home Companion” broadcast in Colorado was in Denver in 1992. In a phone interview from St. Paul earlier this month, Keillor says he’s looking forward to coming to Durango – a place he has passed through. Keillor is talking from Minnesota Public Radio’s offices. He just got in and he says he’s feeling guilty for having spent too much time online that morning. Keillor says he’s overcommitted and overpledged. Isn’t that a typical American problem? Keillor doesn’t let the guilt weigh him down during the interview. He speaks freely and contemplatively. On distant phone lines, you can imagine Keillor pursing his lips as he thinks about his answers. He is gentle and polite. And with as much work as he claims he’s committed to, he doesn’t rush the nervous writer who has so many questions that they are written on a scroll. They are all good questions, I think, because Keillor surely knows the answer to everything. Q: What do you think technology, the information super highway, e-mail and all that are doing to society and communities? Are they really bringing us together with the world, or are they isolating us? A: The jury is still out on all of this. It’s still growing and I don’t know exactly how many people are online now and doing e-mail and browsing the Web. It’s a tiny minority, so its impact has not quite been felt. There’s good and there’s bad. A video screen is a terribly inefficient way to read. I also have a suspicion that it’s bad for your eyes. There is nothing as efficient as paper with a binding and an index. People can do a visual search of a magazine much more quickly than using a code or a key word. On the other hand, I’ve been seduced by amazon.com and other purveyors on the Net. I keep in close touch with a man I met in Sweden and my daughter in London and a friend in Rome. Almost daily I keep in contact with people and I like that. It’s a great advantage. It’s much better than a phone. Q: What do you know about Durango? A: I came through Durango about four or five years ago driving from Los Angeles to Minnesota. I started out on the route of Highway 66 and headed north from Arizona and then clipped across that corner of Colorado. I had been across the desert, so I was prepared to like something green and cool. I thought Durango and the valley driving along the river up toward Denver (were some) of the prettiest places in America. I stopped in Durango and maybe walked up and down the street. I don’t remember the street so well as that road that goes along that river (Animas). I stopped several times, got out and walked around. I remember seeing a combination of shops I associate with agriculture and cattle ranching. And shops that I associate with genteel Bohemians and people of my generation who have a lot of disposable income. I’m just a tourist who came through once and I’ve wanted to go back. And I’m using the general public and our tax dollars to finance my own whims. Q: How do Midwesterners perceive Westerners? A: The Southwest we think of as retirement America – part of geezer America. We also have a vague impression about the Southwest as being populated by people who decry government interference in their lives, but who lay claim to every government subsidy that isn’t nailed down. And whose struggle over water rights and use of public lands is not a history anyone would be proud to know more about. I’m not sure I should be saying this to you a few weeks before we arrive. We may all be wrong. Plus, there’s the romance and mythology of the West and the frontier where people went who didn’t fit in back here. Restless daughters and ne’er-do-well sons headed out that way. Q: When you go to a new place, what are the first things you do or notice? A: I like to walk into a grocery store and see if it looks like what I know. I think you can learn a lot about an area from that. Not the big super markets but the smaller marginal stores. If I had time I would want to go to church. When you do a show you want to get out of town as quickly as possible. I like to look around residential neighborhoods because people’s tastes in houses are a little bit different. But in the end, the way you find out is stand up in front of people and look them in the eye. Q: What do winters do to a community? A: Winter is when people really get to know each other; when natural world and environment narrows down and we become indoors people. That’s when people really find out about themselves and about their neighbors and friends. Q: When you are in a big city with a million people, how do you feel as if you count? A: You don’t derive your self-respect from other people. Small towns can be very hard on a person’s sense of self-respect. But you carry this around inside you so it doesn’t matter if you’re in New York, Lake Wobegon or Paris, where you don’t understand a good deal of what’s going on around you. And because you don’t ... you may infer that people don’t like you. Nonetheless you have your same sense of self-worth. If you are badly treated you speak up. A: Don’t make important decisions when you are tired or discouraged. Your danger of making the wrong one is greater. Q: What’s the worst piece of advice anyone has ever given you? A: Don’t worry about the show, it’s going to be OK. The corollary of that piece of bad advice is, ‘You are so talented I’m sure this is going to be very easy for you.’ This is a little piece of flattery people deal out when they want something from you. They want you to come speak to a graduating class. When you say, ‘I can’t, I’m much too busy,’ they say, ‘You are so brilliant, you are such a gifted genius I’m sure you’ll just be able to walk up on that stage and speak for 10 minutes off the cuff and that will be fantastic.’ This is disastrous advice. Q: What is the key to being funny? A journalism professor once told me never try to write humorously because it’s too hard. A: Having friends who are funny. You pick this up by listening to them. You don’t pick it up from television or watching professionals. You get it from your friends and your family. The key is to choose the right family. Your choice of your parents is probably where you decide this. Funny people generally are disreputable. People enjoy comedy but they don’t really respect it. You might like to know one, but you wouldn’t like to be married to one, which is why there’s so much divorce, I think. You should never marry somebody who doesn’t make you laugh. Q: What does it take to be a good storyteller? Is storytelling a lost art? A: It’s a lost art in newspapers, but I don’t think it’s a lost art in everyday life. If someone has a day to end all days, filled with petty harassment and various unlikely mishaps and unpleasant coincidences, what’s it worth if you can’t tell somebody about this. If it’s a really horrendous day, you need to be able to describe it to someone so that they can enjoy this, because we enjoy the misfortunes of other people – so long as nobody is actually killed. You need to deliver a very clear narrative that has just enough, but not too much, detail in order for them to enjoy it, and in order for you to recover from this experience. Storytelling is the basis of the recovery process. It’s very much a part of our lives. Newspapers seem to have given up on it. I think radio is the best medium for telling stories. Words and human voice trigger memory in a way print does not, and television absolutely doesn’t.